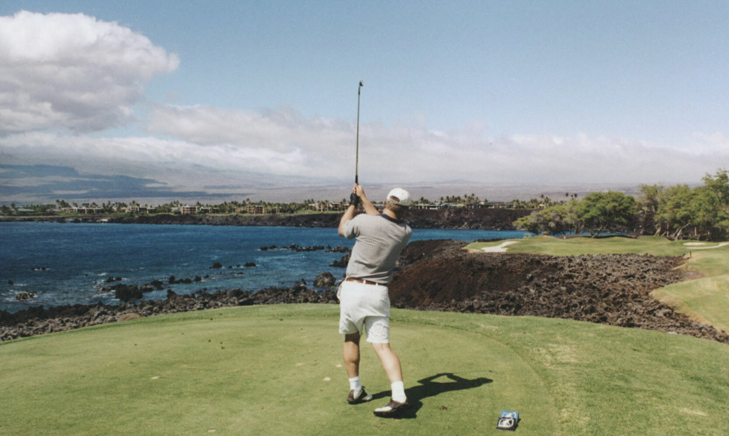 Mauna Lani Resort, South Course Hole 1: The first golf hole of the day presents a pretty good scoring opportunity as it is a medium length par five. The drive has to avoid the large lava outcropping to the right but beyond that, the hole is pretty wide open to a relatively docile green complex. 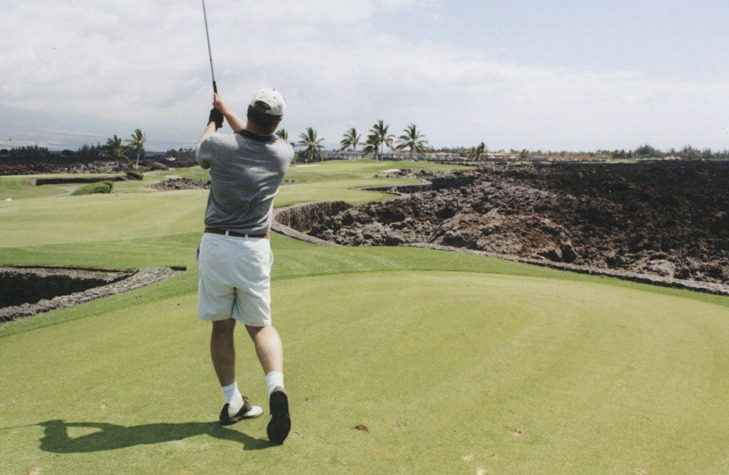 Mauna Lani Resort, South Course Hole 3: The golfer’s first real look at an overwhelming amount of lava on Mauna Lani confronts them on this 215 yard beast of a par 3. Anything that goes a tiny bit right or a lot left is dead, so direction is paramount as the green is large and wide-open if a shot is hit short. Mauna Lani Resort, South Course Hole 4: This long par 5 is usually into the wind and features lakes in play to the left the whole way and one especially tight to the green that will require a really good shot to negotiate sliding between the water and the collection bunkers (and lava) to the right, especially if played from a long way out. Mauna Lani Resort, South Course Hole 5: After the rough 4th hole, this relatively short, straight par four offers a bit of a breather. However, there is plenty of lava on the drive to catch the snoozing player. 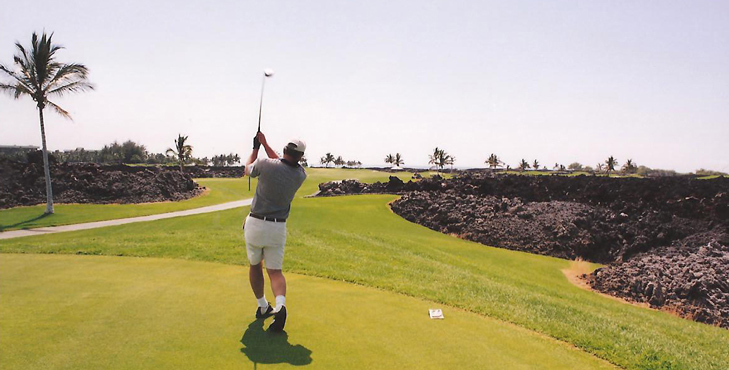 Mauna Lani Resort, South Course Hole 7: Another great par 3 on the front nine, this one gives the player the choice of which penalty they would like if they miss the green: lava, bunkers or Ocean. The green is extremely deep, so club selection is also very important or the player could end up with a very, very long putt. 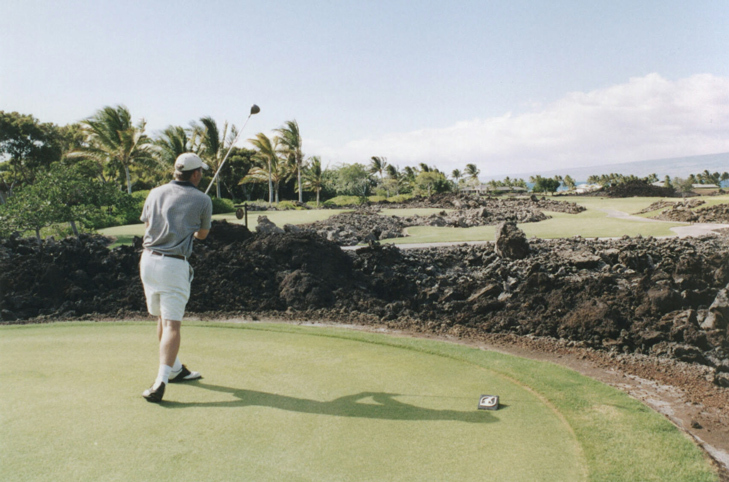 Visually stunning and long, there aren’t many holes as pretty as this one. Mauna Lani Resort, South Course Hole 12 (left):This par three is pretty long and over water the whole way. There is some room left and short of the green to bailout, from which the chip is not that difficult. However, going right is a costly mistake. Mauna Lani Resort, South Course Hole 13: Although not difficult, this hole is pretty as the Pacific Ocean flanks it down the left side. 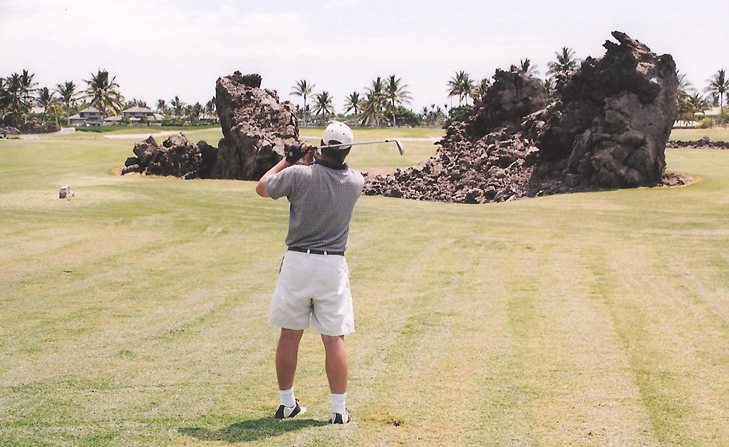 The overzealous drive, even if hit pretty straight can go clear through the fairway into the Ocean, so an iron or fairway wood off the tee is recommended. If positioned well to the left side of the fairway, the approach is wide open to a large and relatively flat green. Mauna Lani Resort, South Course Hole 14: This great and difficult par 4 begs the question when standing on the tee box: where do I go? There are so many patches of lava dotting the rough, fairway and surrounding area it is difficult to muster any courage from the tee. However, at 415 yards, a strong drive is needed to leave a decent approach to the green. 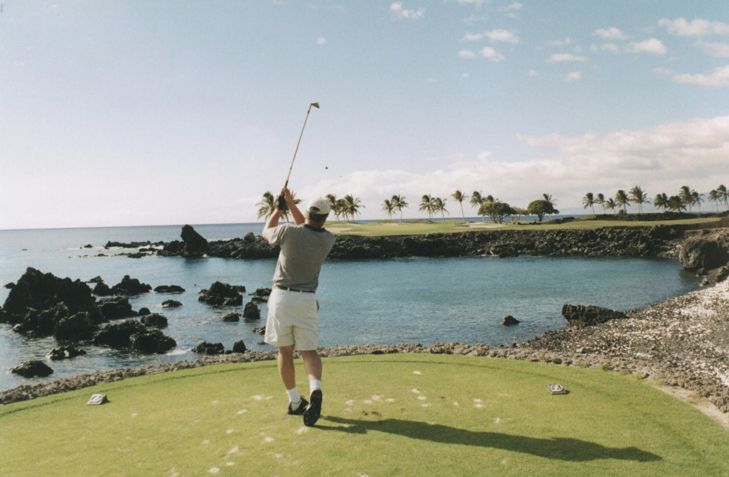 Mauna Lani Resort, South Course Hole 15: The signature golf hole on Mauna Lani is gorgeous and makes many cameos on office walls all over the world. Not many holes can offer shots clear over a beautiful cove of the Pacific Ocean, to a green ringed by bunkers and palm trees, but this one can. 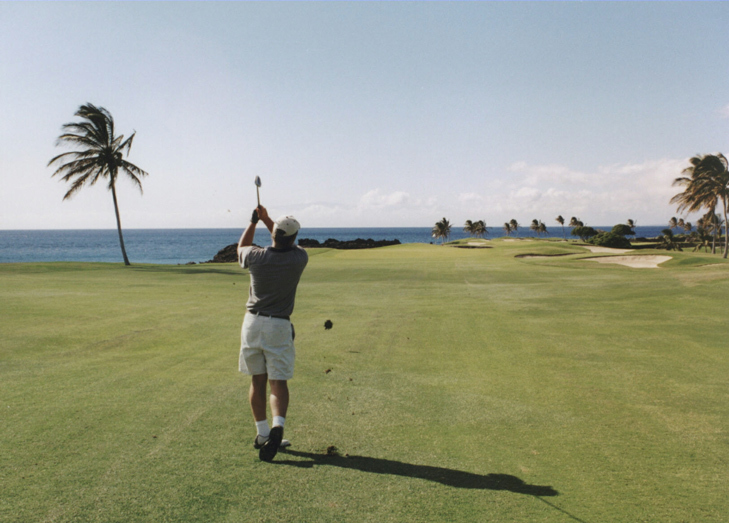 It is not oppressively long or difficult on paper, but the nerves of the player can play a big part on this shot. Mauna Lani Resort, South Course Hole 16: This short par four can be driven in the right wind conditions, but there is lava and OB to the right; played conservatively, there is plenty of room on the generous fairway to have a good shot of short length to the small green. Mauna Lani Resort, South Course Hole 17: With the relatively docile 18th coming, this par four is the last real test on the course. There is water in the form of a lake and small creek to the left on the drive and some lava to the right. If the drive can be negotiated, the approach is to a fairly open green.